Now that you're ready for the benefits of a height-adjustable desk, you'll be glad to know that there's the sleek and adjustable UPLIFT CPU Holder to match. Lift your CPU as you go from sitting to standing, without stretching or pulling cables. The included UPLIFT Track Spacer allows you to mount your CPU holder track over the crossbars under your desk, giving you more flexibility in positioning accessories, especially on smaller desks. Fixed-height desk users can also benefit from the holder as it mounts your CPU to the underside of your desk, instead of housing it on the floor, freeing up much-needed leg space. The holder also helps keep the CPU cooler by getting it off the ground and to a place where it is less prone to accidents. Its unique gliding track mechanism with 360° of swivel also makes it a jiff to access connections in the back. Maximize your space and keep clutter to a minimum - no tangled or stretched cords here - with one simple addition to your desk. 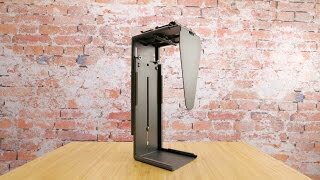 If your computer tower weighs more than 50 pounds, then it is over the weight limit for the UPLIFT Desk CPU holder. We recommend either placing your CPU on the floor or on your desktop. If you place your CPU on the floor, just make sure that you have enough slack in your cords to allow you to fully extend your UPLIFT Desk without pulling any of them out of their sockets. You can move one leg slightly in towards the center to allow enough space to mount your CPU holder on the outside of your UPLIFT Frame. Or you can mount it along the back of the desk, parallel to the crossbar. If you would like to mount your UPLIFT Desk CPU Holder on the inside of the legs, then we recommend adding the UPLIFT Desk Track Spacer. This will allow you to mount your CPU holder over the crossbar beam. If your CPU has bottom rings, then they won't interfere with the UPLIFT Desk CPU Holder. If the rings are on the top of your CPU, then they will either prevent the holder from rotating or you will have to have a space between the top of the tower and the CPU holder. No, the UPLIFT Desk CPU Holder will only fit CPUs that are within the weight and height range specified. If you have a larger CPU, take a look at some of the other CPU holders that we offer. Is this available to fit a larger CPU? Not at the moment. But we do sell other manufacturer's CPU holders that are larger. If there is room underneath your desktop then, by all means, give it a go! The UPLIFT Track Spacer allows you to mount your CPU holder track over the crossbars under your desk, giving you more flexibility in positioning accessories, especially on smaller desks. The CPU holder is great and solid. I feel confident that it will keep my CPU elevated. WARNING! This CPU holder only accommodates CPUs that are 3.75" - 8.25" wide and 12" - 20.5" high. Make sure you measure your tower before buying. Since there was only one option available when building the desk I didn't think to look at the specs and apparently my CPU is slightly too wide. If your CPU is outside these specs they do have other options available that you can purchase separately from another maker. They just don't show you these options when building the desk. Don't make the same mistake I made! Thankfully I made it work for me and it is definitely being held up nicely but it would have been nice to have the correct holder. I really like the CPU Holder. It easily handles my large desktop computer. It's nice having it at the same height regardless of whether you are sitting or standing. The only caution when installing the holder is not to mount it as close to the end of the desk as possible. If you do, you won't be able to push it completely out of the way because your computer will bump into the angled piece of metal that supports the desk. Mounting the holder wasn't easy, but it wasn't that difficult either. I'm glad I got it.